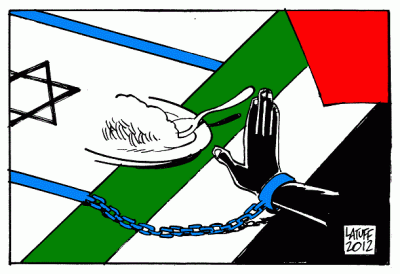 Netanyahu is pushing a new bill to allow the force-feeding of Palestinian hunger strikers. The prime minister is in good company. American practices at the prison at Guantanamo Bay are giving Benjamin Netanyahu ideas. Earlier this week, a draft bill authorizing the force-feeding of hunger-striking Palestinian prisoners passed the first of three readings in the Knesset. Of the roughly 300 prisoners presently fasting in protest of Israeli administrative detention, at least 70 are hospitalized around the country, shackled to their beds. If the bill becomes law, dozens of them may be forced to undergo the procedure. At Guantanamo Bay, military doctors and nurses have medicalized the water cure. They are now using excessively thick nasogastric feeding tubes to force as much as two-thirds of a gallon of fluid into hunger-striking detainees in as little as 20 minutes, twice each day, while they are tightly strapped to a specially-made restraint chair. If a detainee vomits during the process—which is common—it starts all over again. Adding humiliation to the ordeal, the doctors frequently give the detainee a laxative, which can cause him to defecate during the process—after which he may be held in the restraint chair for as long as two hours, sitting in his own filth. One detainee has even reported that often, when he is brought back to his cell, the guards lay him on his stomach and cause him to vomit by pressing forcefully on his back. In 2012, Khader Adnan, a Palestinian held in Israel without charge or trial, agreedto stop his 66-day hunger strike in exchange for release from prison. Several other hunger strikes, including that of Palestinian footballer Mahmoud Sarsak, were called off under similar terms. The prisoners managed to mobilize their only vestiges of autonomy – their bodies – in protest of a manifestly unjust practice. Israel, faced with the fallout of their deaths, no longer found them too dangerous too free. But the Shin Bet is clearly seeking to avoid a repetition of those earlier successes. “You can’t have a situation where prisoners who are in jail for a very good reason will use the threat of a hunger strike to receive a ‘get out of jail free’ card,” an Israeli official recently explained. But what’s the very good reason? Like at Guantanamo, those strikes and this one, which began in April, are a protest against the military use of administrative detention (“indefinite detention,” in American parlance), an oft-used tool in the occupation’s arsenal to detain Palestinians without charge or trial for indefinitely renewable periods. Over the years, thousands have come in and out of Israeli detention, many on a revolving basis. As of April, Israel was holding 191 administrative detainees, according to B’Tselem. They do not know why they are in jail or when they will be released. “People go on a hunger strike for political reasons … and the consequence could be political damage to the state,” said Yoel Hadar, a government legal advisor. In the end, force-feeding isn’t about saving lives, it’s about neutralizing the long-term threat that the likes of Khader Adnan and Mahmoud Sarsak pose to the occupation: the exposure of a system whose raison d’être is repression and control, not security. Guantanamo is 12 years old. Barack Obama continues to claim he wants to see it shuttered. But while Israel may now be borrowing from the U.S. playbook on force-feeding, the tactics of the 47-year-old occupation are clearly focused on the long game.